Cute Lucky Irish Owl Badge in a light green colour with an Irish themed owl wearing a cheeky leprechauns Irish hat and holding a four leaf clover in the colours of the Irish flag. 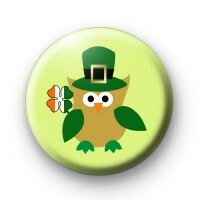 These Irish owl badges are always popular on St Patrick's day, especially with schools & teachers. They are just so cute & ideal to help younger primary students to celebrate St Patricks Day. We have a great range of St Patrick's Day badges available on the website, with hundreds to choose from, make sure you stock up for St Patrick's Day on March 17th. Standard 25mm button badge made by hand in our family workshop & available with international delivery. Free delivery available on all larger orders & we also offer a next day delivery option for UK badge orders.